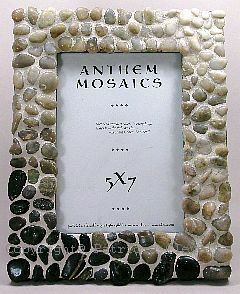 Another nice easy mosaic project is mosaic frames or mosaic mirrors. Why not compliment the gift of a family photo with beautiful mosaic picture frames. These mosaic projects can be inexpensive and are fun to make. Give new life to old ceramic or glass tiles combined to old pottery pieces or ceramic dishes to create beautiful and intricate mosaic picture frames. For tools you will probably need a good pair of tile or glass nippers along with a sponge, gloves and safety glasses. As mosaic tile supplies needed to go with your tiles you will need glue and grout. Now find yourself a frame, either an old one lying around or you can buy some at craft stores. Get yourself a wide and flat frame to allow more room for your tesserae. 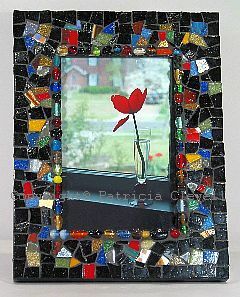 If you will be creating a mosaic mirror simply remove the glass from the frame and replace with a mirror. Once you have your tesserae and frame picked out remove the glass from the frame so not to damage it while making your mosaic. Always lay out your tiles on the frame before gluing them. Work with your frame and tiles until you are satisfied with the final outcome. I always make myself a cardboard cut-out the same size as my frame and use this cardboard to dry run my mosaic! Then when you are happy with your design simply transfer it to your frame by gluing each piece one by one onto your picture frame. Once you allowed the glue to dry for at least 24 hours you can grout your mosaic. Apply the grout with a trowel or use your fingers to spread the grout evenly around the corners and sides of the frame. Make sure you use gloves if you use your hands because grout is very corrosive. Wipe clean with a damp sponge and let it dry for at least 24 hours again. 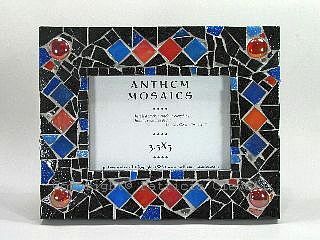 Once your mosaic frame has dried it is time to replace the glass or mirror. Add your favourite picture and hang on a wall or just place it on a side table. You can create many different mosaic picture frames using this technique. The endless combinations of tiles and frames will make this mosaic project a unique work of art! 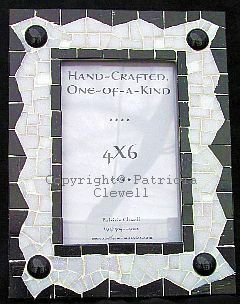 All picture frames featured here are hand made one-of-a-kind works of art created by Patricia Clewell. Thank you Patricia!